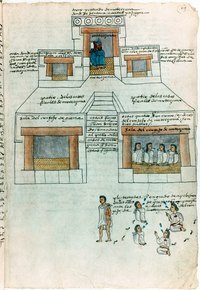 Less than1,000 years ago, a tribe from what would later be known as Northern Mexico began wandering. Their leader told them that the gods had told him that their wandering should continue until they saw “the sign.” For 200 years this tribe wandered looking for the sign. Finally they found the sign, an eagle on a prickly pear cactus eating a snake. They settled into an area of swamps and bogs and built an empire. They called that place Tenochtitlan, or “Place of the Prickly Pear Cactus.” Their ceremonies included fancy headdresses to celebrate their history and way of life. You can make one of these Aztec headdresses with just a little effort. Mark the head band with a line, a circle or other designation to indicate where the front of the headdress is going to be. Working with a uni-colored head band may be confusing when you are placing the decorations simply because of positioning. When you finish adding the decorations this mark will be obscured. If you are using a golf hat, the front will be a little more obvious than the headband. Separate the feathers by length. You will need at least 50 of each size. Aztec headdresses generally used similarly colored feathers all the way around. The more ornate the headdress was, the more important the individual wearing it was in the Aztec culture. You can make this headdress as decorative as you wish. Place the headband or golf hat onto the foam head to hold it in position while you apply the feathers and other decorations. The elastic will snap back when the band is removed, so keep it on the foam head until the headdress is completed and the glue is dried. Set the first of the largest feathers on the right side of the “front” mark you made in the headdress and use super glue to fasten the quill end to the headband. Place the second feather, quill end down, on the left side of the “front” mark. Apply super glue. Repeat this step all the way around the headband alternating from the right to the left sides. Apply the next sized feathers in the same fashion, alternating right to left, filling in any gaps between the larger feathers. Spray paint the cloth strip with metallic gold paint. Let the paint dry for an hour and apply a second coat. Let that coat dry for an hour. Apply a generous portion of fabric glue to the rear of the cloth strip and gently spread the strip over the circumference of the headband or hat. Smooth out wrinkles as you go. Wait for 24 hours for the fabric glue to dry completely before removing the headband or hat from the foam head. Your Aztec headdress is now ready to wear.